Savory rolls snack prepared with gram flour and buttermilk. Mix the gram flour with the buttermilk in a medium sized pan, Add the salt, turmeric, asafetida, and ginger–green chili paste. 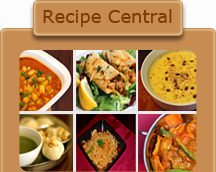 Cook over low heat in a nonstick pan, stirring constantly until the mixture thickens and cook for about 15 minutes. Keep stirring allowing mixture to remain smooth in consistency, without lumps and as it thickens, Close burner. Take 3 to 4 thalis (steel plates). Scoop out 2 tbsp of the prepared warm khandvi mixture onto the surface of the thalis. Allow the mixture to coat the surface and to cool for about 10 to 15 minutes. Heat the oil in a fryer and carefully lift each chakri using a flat spatula and deep-fry on medium heat till it gets a light golden color, flip and fry on other side too. Remove chakri from oil and store in air tight container. Cut each of the rolls into small pieces. 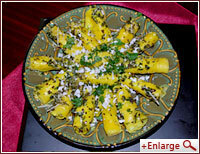 Arrange the khandvi pieces in the serving dish. For seasoning the khandvi rolls. Heat 4 tbsp oil in a nonstick skillet Add the mustard seeds, green chilies, and sesame seeds. Let the mustard seeds splutter. Add the curry leaves. Carefully pour the spiced oil over the khandvi rolls. Decorate with grated coconut and cilantro leaves.